I don’t often do guest posts on my blog. But after Andy Soell helped someone on the Coworking Google Group with some tremendously valuable advice, I had to ask him if he’d be willing to share that same advice here. I’m happy that he obliged. I have a special place in my heart for coworking space operators who have done it all wrong. This story really resonates with me because this is exactly where we were with The Salt Mines. We opened the doors to our space in 2012 with an awesome launch party and coverage from several local media outlets. We were sure that our space was going to be full within a month, and we would have to start looking for larger locations. Four months later, we had a grand total of a dozen people who had visited our space. Some were semi-regulars, coming in once or twice a week, but the vast majority of them came in and worked for the day, never to be heard from again. On their way out they told us how great the space was and how much work they got done, but they still didn’t have the motivation to come back. Why not? Because we didn’t give them a reason to come back. We had desks and wifi and coffee, but they can get all of that at home. What keeps people coming back, what makes them want to come in every day, is the people. If you’re reading this and you haven’t opened your space yet, let me save you a few months of heartache and give you some advice that I wish I had heeded: Build your community before you build your space. I could go on and on about the importance of this, but Alex Hillman of Indy Hall (one of the oldest coworking communities in the country) has already outlined it better than I ever could. Believe me, I know: signing a lease and buying furniture and setting up a big beautiful space for people to work sounds like a lot of fun. And it will be. But build your community first, and then you can build the space together. After four months of loneliness, we knew that we had to take some drastic steps to turn things around. We started by looking at our financial model, gutting it, and recreating it from the ground up. Then, we took steps to get as many people in the space as we could to give them a good look at what a coworking space filled with awesome people really looks like. In an effort to appear as flexible as possible, we had originally opened with a punch-card style payment system: Visitors paid for packs of days that could be used at their convenience and the more days they bought, the cheaper each day was. The problem we found with this approach was that it put the focus of the value of coworking on the price-per-day, and actually discouraged people from coming in. This was a good first step, but we also needed to get a critical mass of four or five people who were tired of working alone in the space so they could see what working with other independents was like. 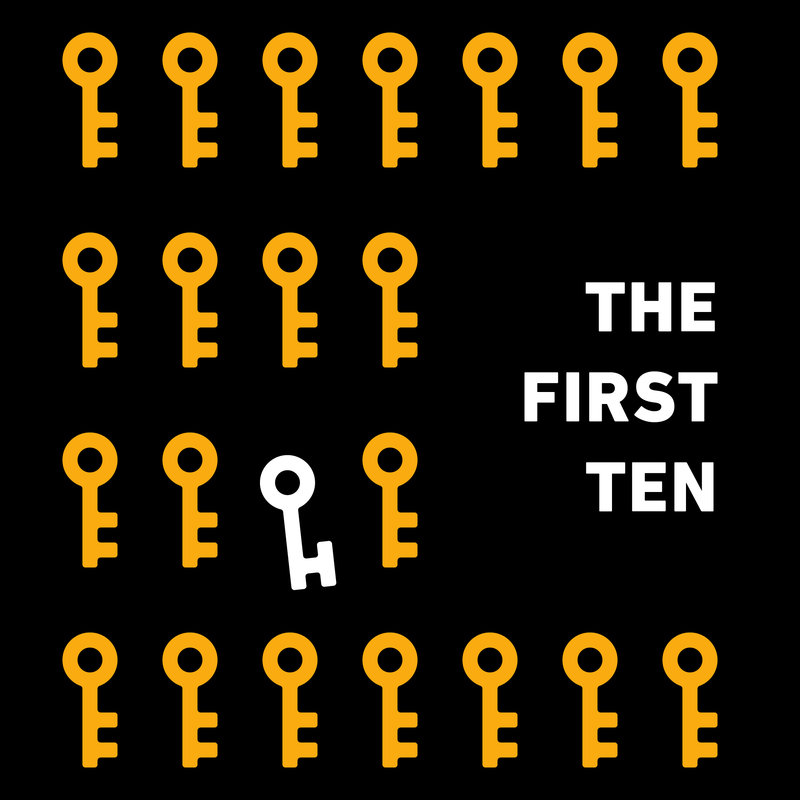 We set a date and launched a week-long membership drive with the stated goal of getting people in the space, committed to using it for a full week, and giving them a real coworking experience. We spent about two weeks promoting the week-long open house and building up anticipation. We were fortunate enough to get a little extra attention from the same media outlets that covered our launch, and we mobilized our Twitter and Facebook audience to spread the word: Free coworking—and free coffee—all week long! We knew things were going to be different right on the first day. Several old familiar faces stopped in to give us another chance, but we were also joined by a crop of brand new people. People from every profession you can imagine. Teachers, non-profits, authors, journalists, students. We had more people in on that first day than we had in the four previous months. We blew through our first pot of coffee in an hour. People were talking with each other. People were getting work done. Even better than that, meaningful connections were being made. People who had never met were going out to lunch together and talking about potential collaborations. The next day we saw about half of Monday’s crowd return along with a new batch of people interested in checking the space out. This was when we started emphasizing the most important part of our membership drive week: Signup specials. We knew attendance that week was going to continue to be great, and we wanted to give our new prospective members a big incentive to continue to make us—and each other—part of their new daily routine, so we offered 50% off for the first six months. In an effort to encourage them to sign up quickly, we limited this special to the first three people to sign up at each level. This made the decision to continue with us a little easier to make and people responded quickly: on Tuesday, we signed up our first Full Time member. The days that followed continued the trend: A sea of new and familiar faces. As we publicly welcomed new members who had signed up, others who had been thinking about joining signed up quickly so they wouldn’t miss out on the discounts. By Friday evening we had a dozen committed people who had already been working alongside each other for a week and who were eager to keep working together and build a community of active independent professionals. In the weeks that followed, we had a minimum daily attendance of four or five members. Not all of our founding members stuck around for the long-term, but in the year that has followed more than half of the original members are a still a core part of our community, and I can’t imagine working with a more incredible group of people. Regrets are a funny thing: I love where our community is now, so I can’t say that I regret those first few months. That said, I would absolutely do it very differently if I were doing it over again. Building the space before building the community is the biggest way to ensure a false-start, but if you find yourself with a big empty space, lots of pretty furniture and nobody to share it with, don’t give up hope. Give people a glimpse of what it is that makes coworking so great, get them to commit to a window of time to see what working in community can be like, and they’ll never go back. It may take a sizable financial incentive to get them in, but once they’re on board and your community gains momentum you’ll never have to worry about being able to provide that taste to prospective members who walk through your door in the future. Do’s and Dont’s for photos of coworking. What’s missing from this picture of a coworking space? If your first thought was “Where are the people?”, you’re already a step ahead of SO many people who are trying to run coworking spaces. For a “collaborative space”, I don’t see the #1 thing I need to collaborate: other people. “Collaborative spaces” is kind of a misnomer, when you think about it. The space doesn’t really do the collaborating. And when collaboration is what someone is craving, I promise you that a room full of empty desks is the last thing they’ll get excited about. Even if they’re fancy desks that you spent a WHOLE lot of money on. Today, I’m picking on one example from a new coworking space in Brazil, which literally hit my inbox this morning, but we’re really looking at the the single most common mistakes I see made by coworking spaces of ALL kinds and sizes: when their first impression puts the spotlight on ANYTHING other than their community members, things start to go horribly wrong. Ask yourself, what photos would members take of life in your community? What moments would be interesting enough for them to want to capture and share with somebody else? People are attracted to photos of other people doing the things that they themselves want to be doing. THOSE are what you want in the photos you put on your website, in newsletter, etc. When we answered those questions ourselves, we came up with some ideas for the photos we should use (and avoid like the plague) for showing off Indy Hall at it’s best. 1 – At all costs, avoid taking photos without any people. You may be excited about your fancy new furniture, but you’re the only one. Pictures of desks or furniture, empty rooms are cardinal sins. 2 – If you have a picture with only one person, show them in action or with some other visual interest. Just about everybody knows what a person sitting at a laptop looks like, so skip that (or do it once to get it out of your system). Try showing people in motion, walking through the space, maybe to visit another member, or to grab a cup of coffee from the kitchen. If you’re going to show them by themselves, show how it’s better than being alone at home or in a cafe. 3 – Photos of people doing things together are the best. They wouldn’t need your community if they wanted to do things on their own. So show them what it looks like when members of the community do things together. Even with staged photos, don’t ask your members to do something they wouldn’t otherwise do. Think of staged photos as ‘recreations’ of reality, rather than plucking them from your imagination. Bonus tip: How to include photos taken by your members. When the goal is to capture photos that would show life in your community from the eyes of your members, the best people to take those photos are members themselves! These days, a lot of people have cameras on their phones and snap/share photos of things they experience. If you invite them to use a unique hashtag when posting on Instagram, you can embed those photos as they’re taken in your website using a little bit of code, or a service like Web.stagram. 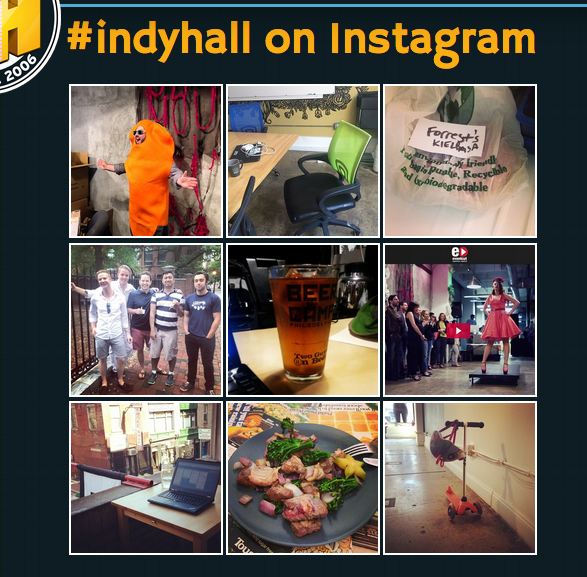 We even grab Instagram photos and automatically share them into our chat room, where they prompt more conversation…which we can take a screenshot of, and share more of life at Indy Hall. 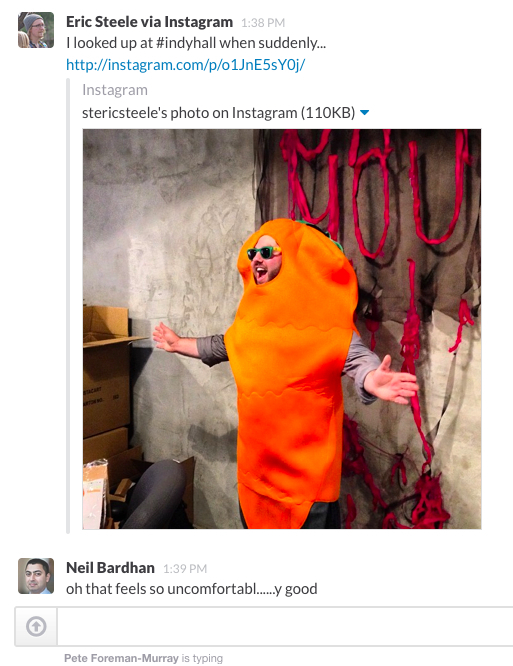 If you use Slack for community chat (we do, it’s awesome), you can use this Zapier integration to do the heavy lifting of posting new photos with an Instagram hashtag into your Slack room. Don’t wait to redesign your website, let’s do this right now. Take a picture of your community in action and share it in the comments, or on Twitter (mention @alexhillman so I see it!). I’m looking forward to meeting your members.